Hollywood , CA — The Greater San Fernando Valley Chamber of Commerce will welcome incoming Board Chairman Dr. Barry Leonard, Owner of Dr. Barry Leonard & Associates at the Inaugural Ball on June 16, 2012 at the Hollywood Roosevelt Hotel in Hollywood. His commitment to the Chamber makes him an obvious choice to lead the organization for a second time. Instrumental in the successful merger of the Greater Van Nuys Area Chamber with the Panorama City/Sepulveda Chamber in 1989 to what is now the Greater San Fernando Valley Chamber of Commerce, Dr. Leonard is truly a leader in the Valley business community. Click here to watch Dr. Barry Leonard star as Bond, James Bond in the 101st Inaugural Ball short film The Chamber Book of Secrets. In addition to the Chamber, he is involved in several community groups including Mid-Valley Jeopardy Foundation, Rotary Club of Van Nuys, and Mid-Valley Community Police Council. Dr. Leonard was born and raised in the San Fernando Valley. He continues the family-owned optometric practice his father opened in 1957. He is very active in the optometric community as the secretary/treasurer of Volunteer Optometric Services to Humanity – California (VOSH), whose primary mission is to facilitate the provision of vision care worldwide to people who can neither afford nor obtain such care. He has traveled the world providing eye care services and free glasses to those in need. In January of this year, Dr. Leonard was appointed Clinical Assistant Professor for the Western University College of Optometry. The Greater San Fernando Valley Chamber of Commerce is the Valley’s premier business organization promoting economic vitality and community growth. 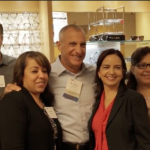 Our experienced leadership and burgeoning membership work together to make the Chamber a powerful force in improving the quality of the community and economic life in the dynamic San Fernando Valley.